The activity is the core of an android application. Each application can have one or more activities. In this post we are going to explore the activity’s life cycle and understand the event handler of each stage through the activity’s life cycle. Activities in the system are managed in an activity stack (Last in Last out). When a new activity is launched it becomes on the top of the stack. Any previous activity will be below it and won’t come to the top until the new one exists. The application on the top of the stack has the highest priority from the operating system. While the activity that is not visible has lower priority even if the a running activity requires more memory, the system can shut down that activity to free memory. Android runs each activity in a separate process each of which hosts a separate virtual machine. Android saves metadata (state) of each activity so that when a new activity launches so that it can come back to the activity when the user backtracks. Active: the activity started, is running and is in the foreground. Paused: the activity is running and visible but another activity (non full sized) is running on the top or a notification is displayed. The user can see the activity but can not interact with it. A paused activity is fully alive (maintains state and member information) but can be killed by the system in low memory situations. Stopped: the activity is running but invisible because the user has launched another activity that comes to the foreground the activity is alive (maintains state and member information) but can be killed by the system in low memory situations. Dead: either the activity is not started or it was in pause or stop state and was terminated by the system to free some memory or by asking the user to do so. The activity starts, passes through onCreate(), onStart() the activity is still not visible to the user, onResume() then it comes to the foreground and becomes fully running. 1.if the system decides to kill your activity due to low memory the activity starts the cycle again from onCreate() method with Bundle savedInstanceState parameter that holds data about the previous state of the activity. When the user is about to close the activity the activity calls onStop() method then onDestroy() method when the system destroys the activity. But if another activity runs while the current one is was not shut, the activity calles onStop() method and if it is not killed by the system it will call onRestart() method then onStart() mehod and continues the cycle. - the activity runs for the first time and it will be invoked with null Bundle savedInstanceState parameter. - the activity has been running then stopped by the user or destroyed by the system then it would be invoked with Bundle savedInstanceState that holds the previous state of the activity. - the activity is running and you set the device to different resources like Portrait vs landscape, then the activity will be recreated. in this method you will create the user interface, bind data to controls and register the event handlers for the controls. Then it is followed by onStart() method. it would be followed by onResume() if the activity continues and comes to foreground, or by onStop() if the activity is killed. onRestart(): is invoked in case the activity has been stopped and is about to be run again. Always followed by onStart() mehod. 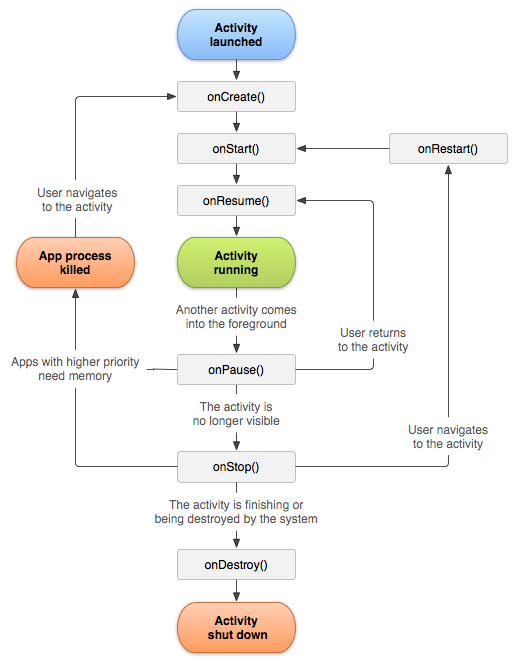 onResume(); invoked when the activity is about to come to the foreground and is on the top of the activity stack. It is the place where you can refresh the controls if the activity is using a service that displays some feeds or news. Always followed by onPause() method. onPause(): is invoked when another activity launches while the current activity is launched or when the system decides to kill the activity. In this method you have to cancel everything you did in onResume() method like Stopping threads, stopping animations or clearing usage of resources(eg the camera). This method is followed by onResume() if the activity returns back to front or by onStop() if the activity is to be invisible. onStop(): is invoked when a new activity is about to come over the current one or the current one is to be destroyed. Always followed by onResume() if the activity comes back or onDestroy if the activity is to be killed. onDestroy():is invoked when the activity is shutting down because the activity called finish() [terminated the activity] or because the system needs memory so it decided to kill the activity. The entire activity life cycle is between the onCreate() where you construct the UI and aquire resources and onDestroy() method where you release all resources. The visible life time of the activity is between onStart() and onStop(). Between the activity is visible to the user although he may be unable to interact with it. Between the two methods you persist the state of the activity so that if another one comes to the foreground then comes back to the original activity you find the state persisted. The foreground lifetime is between the onResume() and on Pause(). During this time the activity is fully interactive with the user. The activity can go through the resume and pause states many times (if the device sleeps or a new activity launches) so the code should be very lightweight. Open Eclipse and select from the menu File>New>Android Project, you’ll see a window like this. Project Name: The Eclipse project name, the name of the folder that will hold the project files. Application Name:The name of the application that will appear on the phone. Package Name: The package name space, it sould be in the form of [abc].[xyz]. Create Activity: the name of the basic activity class of your application. it’s optional to create. Min SDK Version: the minimum API level required by the application. You see in the Build Target list there is a list of the available SDK versions to use for the application and in front of each one the corresponding API level. You must ensure that you application API level is supported b the device. Notice: the emulator may take a long time to boot so please be patient. We will explain what each line in this code means later but now let’s understand what each folder in our project contains. So that was a quick look on the android project structure, in this post we will take a deeper look on the hello Android application. Android provides three other types of resources that can be defined as XML files in the res/values folder. These resources can be Colors, Arrays and Dimensions. You can define XML files that contain definitions for colors that can be used in your application. Colors in Android are hexadecimal RGB values, also optionally specifying an alpha channel (transparency). #ARGB (Red with Alpha 5: #5F00). #AARRGGBB (Red with Alpha 50: 50FF0000 #). You can define Dimension resources to use them with your widgets to define padding, width or height. Density: (dp) density-independent pixels based on 160 dpi (dot per inch). Array resources allow you to define custom string arrays that hold values you can use in your application such as a countries list or a list of names. An Array resource is defined using string-array element while items are defined using item element. Android provides us with the ability to use image resources in our applications. We can put image files in res/drawable directory and access them from the xml layout or by the generated ID from R.java class file. If you use two files with the same base name you will receive an error. You cannot use two files like Hello.jpeg and Hello.png. If you create any subdirectory under res/drawable directory any image files in it will be ignored. notice that if the textview does not have text the background color will not appear. This is a pretty example of Plain text resources. The resource with name=”app_name” is the name of the application that appears when you deploy the application to the phone, it’s referenced in the AndroidManifest.xml file in the application tab. You can change it as you want. See that to reference the first string we use the @string/[Resource Name] convention. Also notice the way you access the string resources in Android, you don’t open the strings.xml file and parse it t extract the values you want to reference- instead you access them through the R.string class defined in R.Java and Android does the rest for you. You can define resources manually by choosing the CustomStrings.xml tab or by using clicking Add button and adding the name and the value of the resource. the %1$s is the place holder that would be replaced by a variable string. and the text view will have a text equal to This is resource for Giving an example of string format resource. notice that we use setText() method by calling the string resource directly. we can use the HTML styled text also by using spanned. Android provides the assets folder to put files that you want to include with the package. The files in assets folder do not generate an ID in R.java file. You access them in the same way you access files on the file system in any programming language. The first line is the package name of the application. , Activity represents the User interface of your application much like windows or web forms. Our class contains one function which is onCreate(Bundle savedInstanceState). This function is called when the activity is first created, it should contain all the initialization and UI setup. The basic android application with only one view consists of a class that extends the Activity class. This class preserves the activity frozen state (like viewstate in asp.net) and it displays the UI defined in xml file or defined explicitly programmatically.